Is Brazilian Hair Straightening a Miracle Treatment? A new treatment for smoothing out unruly hair is springing up all over the country. Although Brazilian Hair Straightening (sometimes called Brazilian Keratin Treatment,) has been around for a little while, it has caught on like wildfire in the last six months or so since American manufacturers have started producing the Product. Marcia and Marcelo Teixeira, of M&M International, in Delray Beach Florida, says Brazilian Hair Straightening business has “been nuts,” since they started manufacturing the product last January. Salons are reporting the phones are ringing off the hook with calls about Brazilian Hair Straightening. Brazilian Hair Straightening Chat rooms are active with women wanting more information about the product and it’s results. You may want to go the full way and get a Brazilian wax too, for more information abut the process, head over and check out: http://waxingbyceleste.com/hair-removal-san-diego/brazilian/. The Good News ~~ Unlike the Japanese Thermal Straighteners, the Brazilian Hair Straightening treatment is technically not a straightener or a relaxer. The Japanese Thermal Straightening, can be extremely hard on the hair, which has been its demise. Brazilian Hair Straightening, on the other hand is made up of a keratin like protein, which when brushed on the hair and flat-ironed out, leaves the hair in beautifully silky, shiny condition. It doesn’t penetrate the hair shaft or alter bonds of the hair as a Japanese Thermal Straightening will do. A hot flat-iron seals the keratin on the outer cuticle layer, sealing in moisture, hydrating the hair. Brazilian Hair Straightening can be used on both color treated and high lighted hair with apparently no ill effects and is reported to tame the utmost unruly hair. 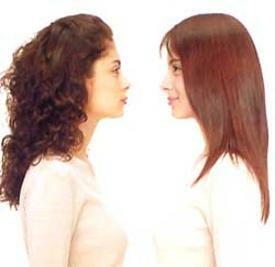 The treatment can lasts about 3 months and will cost from $150.00 to $600.00 depending on thickness and length of hair. Styling is reported to take minimal blow drying to achieve a finished look. The Bad News ~~ There have been some health concerns about Brazilian Hair Straightening in the industry. The solution contains formaldehyde, classified as a “probable carcinogen,” by the EPA. Formaldehyde, however, is also present in many household and beauty products such as lipstick, mascara, nail polish and some toothpaste. The FDA does not regulate cosmetics but OSHA has set guidelines that in the workplace there be no more than 0.75 parts formaldehyde per million in an airborne environment over a period of eight hours. OSHA restricted using a spray bottle for application of Brazilian Hair Straightening and instead professionals must use a bowl and brush. Opponents say that by heating up the solution on the hair, it causes a more gaseous environment. You can read some testimonials. Here is what ELLE magazine reported on Brazilian Hair Straightening. They also list their top 9 picks for at home products for straightening your hair. If you’re in the market for a new ceramic flat iron, Misikko has what you’re looking for. Whether it’s an FHI Flat Iron or a pink chi flat iron, Misikko has it in stock at an unbeatable price… And all orders $50 and over come with free 2 day shipping! January 13, 2014 By: Barb Quinn Hairstyle Blog Leave your comments (1), Your input matters. Where could one get this done in Ohio?